What is the linear interpolation? This linear interpolation calculator is a handy tool for finding points lying on a certain line - either determined by two points or directly by the slope intercept form. This article will provide you with the linear interpolation equation and explain in detail how to use it. Thanks to this calculator, you will be able to find the linear interpolation (or extrapolation) in no time! Imagine that you are try to measure the dependence between the amount of flour you use to bake cookies and the number of cookies that you get. The first time you used 200 g of flour and got 15 cookies, and the second time, while using 300 g - 20 cookies. You want to know how many cookies you get if using 250 g of flour. If you assume that the relationship is linear, what you are looking for is called linear interpolation. If you would be looking for a value that is beyond the tested range (for example, 500 g of flour), it would be called extrapolation. (x, y) are the coordinates of the point you are looking for. The formula for extrapolation is identical. You need to remember, though, that extrapolation often gives results that are not confirmed by experimental data, so unless you are sure that the relationship is linear, it's always better to use interpolation instead. Let's solve the cookie problem together. How many cookies can you bake with 250 g of flour? Determine the coordinates of the first data point. In our case, x₁ = 200 and y₁ = 15. Determine the coordinates of the second data point. In our case, x₁ = 300 and y₁ = 20. Choose the x-value for the point you are analyzing. In this case, x = 250. 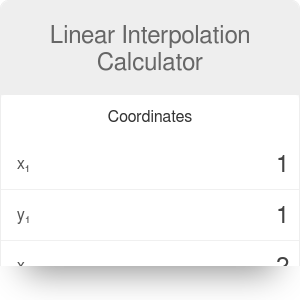 The linear interpolation calculator will provide you with the slope and intercept of the linear equation determined by the two points. In this case, m = 0.05 and b = 5. You can also use this linear interpolation calculator for extrapolation - for example, you can calculate what amount of flour is required to bake 50 cookies. Make sure to take a look at our distance calculator to find the shortest distance between two data points. Linear Interpolation Calculator can be embedded on your website to enrich the content you wrote and make it easier for your visitors to understand your message.